WPF has two concepts of controls: UserControls and CustomControls. But what’s the difference between them? In this article I try to list the characteristics of each of them to help you to choose the right type for your project. This example of an “RGB user control” composes three labels and textboxes as well as a color field together to an reusable part. The logic in the code behind file adds a Color DependencyProperty that gets and sets the resolved color. This example of a “Numeric up/down” control is an extension of a textbox. The up and down buttons are defined in the default template of the control and wired up in the OnApplyTemplate() override in the logic part of the control. The ControlTemplate can easily be exchanged by another that has the up,down buttons aligned left for example. Step 1: Open VS 2010 and create a blank solution and name it as ‘WPF_CustomControl’.. Step 2: To this solution, add a new WPF Custom Control Library Project and name it as ‘WPF40_FileUploadCustomControl’. This project will have ‘Themes’ folder containing ‘Generic.Xaml’. Also this project will contain ‘CustomControl1.cs’ code file. This file will contain necessary business logic of the control. The above code defines only the control template which contains ‘StackPanel’, ‘TextBox’ and ‘Button’ visual elements. One important here is that since this is just a resource dictionary, you cannot define any event on the elements. Define TextBox and Button at class level as shown below. This will be instantiated using the controls names set in the template XAML above in Step 3. Since this control is used to upload the image and this will be displayed in the container of this control, I have declared the following dependency property name ‘FileName’. The above method shows how the Button and TextBox objects are created using the respective control name from the ‘Generic.xaml’. Write the following code in the Browse button event. This code will launch the open dialog box and then the file can be selected. Write the following code in the TextChanged event of the textbox, here e.Handled = True’ will stop the event at the control level itself and the ‘FileNameChanged’ is raised. This event is then handled in the container WPF application. That’s it. Build the control. Create a WPF Application for using the Custom Control. Step 1: In the same solution, add a new WPF Application and name it as ‘WPF40_FileUploadContainer’. 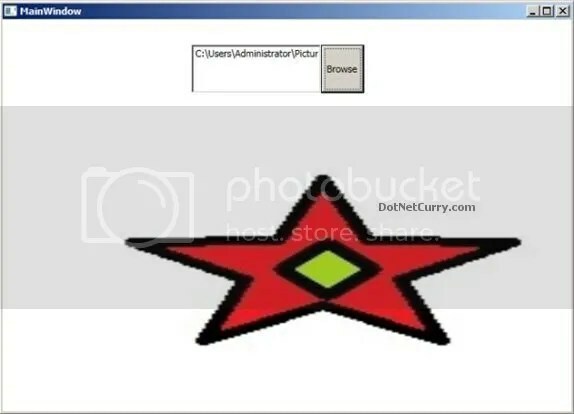 Step 2: In this project, add the reference of the ‘WPF40_FileUploadCustomControl’ library so that the control can be used. The above code represents the event handled on the container for the Custom Control. Step 5: Run the application. What functionality will be performed by the control? This will help in selecting Visual Elements for designing UI for the control, along with the business logic for it. What data will be either consumed by the control or published from the control? This will help in defining dependency properties for the control. These properties will be used in DataBinding. When will this control publish the data to its container? This will help in defining routed event for the controls. I need to to thank you for this great read!! I definitely enjoyed every little bit of it. Inversion Of Control(IOC) or Dependency Injection(DI)?